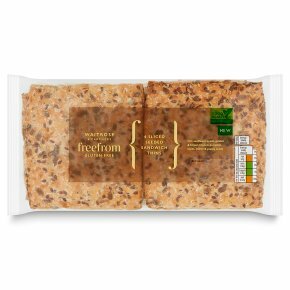 4 gluten free presliced sandwich thins made with a blend of sunflower seeds, golden linseed, brown linseed, pumpkin seed, millet and poppy seeds. with sunflower seeds, golden & brown linseeds, pumpkin seed, millet and poppy seeds. INGREDIENTS: water, rice flour, mixed seeds (14%) (sunflower seeds, golden linseed, brown linseed, pumpkin seed, millet, poppy seeds), tapioca starch, potato starch, dried free range egg white, bamboo fibre, yeast, rapeseed oil, psyllium husk powder, concentrated prune juice, thickener (hydroxypropyl methyl cellulose, xanthan gum), sugar, fermented brown rice flour (fermented brown rice flour, brown rice), salt, white wine vinegar.